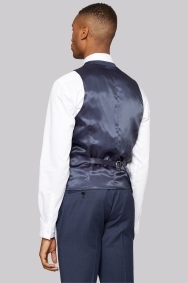 When it's time for something special, rely on this indigo waistcoat from DKNY. Whether you're crafting a wedding day outfit or dressing for a big night out, a waistcoat will always take your look to the next level. This single-breasted number is made from premium pure wool, comes with a textured finish and is cut for a slim fit that'll guarantee you the sleekest of profiles. 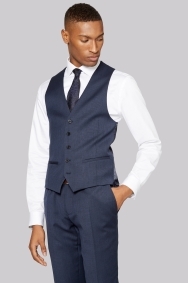 A slim fit white shirt will look right at home under this waistcoat. Alternatively, choose a lilac shirt paired with a deep purple tie to add an extra splash of colour to your outfit. Nice waistcoat. This survey does my head in, asking for long comments on every single product!!! It was meant to take a minute only!! !